Hi, everyone. Just letting you know that The Calvanni, first in my three-book heroic fantasy series The Jakirian Cycle, is now FREE on iBooks, Kobo and GooglePlay! If you were waiting for a chance to start this epic series, there has never been a better time!!! "A truly imaginative work with strong characters and believable societal laws and legends set in a well-drawn world." "Ellen’s father is dying . . . He names her ruler in his stead, the first of the surprises in Brisbane writer Chris McMahon’s debut novel, The Calvanni. . . Muddying the waters are the plots of numerous forces: the dark sorcerer Raziin, his cruel master Hukum and Cedrin the Calvanni, just for starters." "McMahon has written an extremely interesting novel here. . . The writing is engaging and the pace is at that perfect level. . . I found myself reading that 'extra' chapter after I had decided to finish my reading for the day." "Think Kill Bill meets Dune . . . McMahon offers a contemporary updating of a popular genre . . . Here’s something for the lover of swashbuckling heroes and sword play and toe curling tension." "Highly recommended. Great series. Well written. Original ideas. Moves at a good pace. Read it. Read it. Read it!" "Fabulous Fantasy Trilogy. . . one of the best books I’ve read in a very long time. I enjoyed it very much, and stayed up almost all night to finish it. Couldn’t put it down! Do yourself a favor and read this book!" ". . . all diehard fantasy fans will relish this imaginative novel." "Ellen’s father is dying . . . He names her ruler in his stead, the first of the surprises in Brisbane writer Chris McMahon’s debut novel, The Calvanni . . . Muddying the waters are the plots of numerous forces: the dark sorcerer Raziin, his cruel master Hukum and Cedrin the Calvanni, just for starters." "Exceptional First Novel. The promise of excellent worldbuilding is kept . . . McMahon has learned the lesson of subtly drawing a reader’s attention to the important details and building on them as they are mentioned. The strangeness of the world becomes less strange but more wondrous since the environmental, biological, magical and cultural aspects of the story and seamlessly integrated and operate together." "If you’re after a fast paced, complex adventure with detailed world building, politics and characters, then The Calvanni may be just what you’re looking for." "A Great Read. Very entertaining and enjoyable read, with a nice amount of intrigue, suspense and mystery. I love the characters and scenarios." ". . . a cunningly written example of survival against odds of an inhuman scale, written against a masterfully-crafted space opera backdrop"
"The Tau Ceti Diversion harks back to a golden age of science fiction . . . with life and death struggle a real and present challenge at every turn." "This is a great novel from an talented novelist of our age. McMahon has written a book that will not only take you out of this world, but draw you into something far greater than what has come before." "Chris McMahon wrote a terrific story that sustains intrigue right to the end." "McMahon covers the theme of human evolution with a dexterity rarely seen in science fiction." ". . . how is humanity evolving? Does our technology really separate us from other creatures? Are we on the right path today to reach the stars? If you like exploring these questions, this is the novel." "I literally devoured this addictive story . . . McMahon has written an inspired creation of wondrous proportions, substance and scope that’s enviable of many fantasy writers (both contemporary and classic) . . . the perfect combination for an out-of-this-world read. I found myself reading just another chapter … and another chapter … I was hooked! I highly commend such a skilled author." "I love fantasy adventures, and the characters, world and plot in this one fulfilled all I hoped for. . . The sword and sorcery, which I love, is top notch. The characters are in-depth and believable. 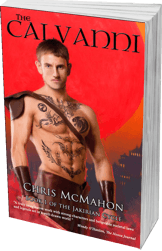 The main protagonists were very likable – I was rooting for them all the way – and the antagonist is multidimensional as well"
Order Chris McMahon's works online through your preferred book store. New from Chris McMahon! The Tau Ceti Diversion! Get started on The Tau Ceti Diversion with a Free First Chapter. Can We Guess Why Warmaker is a Standalone Novel?